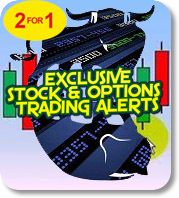 Disclaimer : BullsToBears.com Exclusive Stock and Options Trading, Subscription Area - Where The Bulls and Bears Play! BullsToBears.com ("BTB") is a provider of independent market commentary, investment opinions and research. The information provided within this Web site is for informational purposes only. Users should always check with their licensed financial advisor, including their tax advisor, to determine the suitability of any investment. BTB recommends that anyone trading securities should do so with caution and prior to the execution of a security trade based upon information from BTB, should consult with his or her broker or other financial representative. All users are encouraged to fully investigate any security before making an investment. Users should obtain annual reports and other company information to complete their own due diligence in any investment. BTB calls to users' attention a Web site maintained by the Securities and Exchange Commission (the "SEC") where users can access, for purposes of such due diligence, reports, proxy and information statements, and other information regarding certain companies that file electronically with the SEC. The SEC also provides information regarding cyber fraud and other improper activity. The address of this Web site is http://www.sec.gov. Additionally, the National Association of Securities Dealers Regulation provides perspectives on how to invest carefully online at http://www.nasdr.com. Neither BTB nor anyone affiliated with BTB is responsible for any investment decision made by any user. BTB has made reasonable efforts to ensure that content and information developed or written by it and provided on this Web site is accurate at the time of inclusion; however, there may be inadvertent and occasional errors for which BTB apologizes. Certain statements or information contained in this Web site were developed or written by, or contain or are based upon statements or information developed or written by third parties. All such statements or information is the property of the original publisher. No independent verification of the accuracy of such information or statements has been made and BTB does not guarantee the accuracy or completeness of such information or statements. All opinions reproduced or retransmitted in this Web site are solely the opinions of the author and should in no way be construed as the opinions of BTB. The statements made herein contain general information and do not constitute an offer to buy or sell any security. All information and opinions expressed herein are subject to change without notice. BTB, its employees and/or its affiliates, and family members of the foregoing, may act as consultants to the companies discussed, and may from time to time take positions in the open market or otherwise with respect to the securities discussed on this Web site. Opinions and recommendations contained herein should not be construed as investment advice. Do not assume that any recommendations, insights, charts, theories, or philosophies will ensure profitable investment. BTB does not endorse any recommendation or opinion made by a user, nor does BTB advocate or recommend the purchase or sale of any security or any other investment. Credit/Debit Card Payment/Your Contractual Obligation: The Credit Card and Debit Card payment service is an Internet-based service that allows you to make payments to BTB via the World Wide Web. In activating this service you authorize BTB or its authorized agent to debit or charge your account which allows your payment to be forwarded to us, based on the payment instructions you provide on the Web site or verbal over the phone, is subject to our Terms and Conditions. A. USE OF THE FORUMS AND THIS WEB SITE ARE AT USER'S SOLE RISK. NEITHER BTB, ITS AFFILIATES, NOR ANY OF THEIR RESPECTIVE EMPLOYEES, AGENTS, THIRD-PARTY CONTENT PROVIDERS, OR LICENSORS WARRANTS THAT USE OF THIS WEB SITE WILL BE UNINTERRUPTED OR ERROR FREE; NOR DO THEY MAKE ANY WARRANTY AS TO THE RESULTS THAT MAY BE OBTAINED FROM USE OF THIS WEB SITE OR AS TO THE ACCURACY, RELIABILITY, OR CONTENT OF ANY INFORMATION, SERVICE, OR MERCHANDISE PROVIDED THROUGH THIS WEB SITE OR THE FORUMS. C. THE DISCLAIMERS OF LIABILITY CONTAINED IN THIS SECTION APPLY TO ANY DAMAGES OR INJURY CAUSED BY ANY FAILURE OF performance, ERROR, OMISSION, INTERRUPTION, DELETION, DEFECT, DELAY IN OPERATION OR TRANSMISSION, COMPUTER VIRUS, COMMUNICATION LINE FAILURE, THEFT OR DESTRUCTION OR UNAUTHORIZED ACCESS TO, ALTERATION OF, OR USE OF SERVICE, WHETHER FOR BREACH OF CONTRACT, TORTIOUS BEHAVIOR, NEGLIGENCE, OR UNDER ANY OTHER CAUSE OF ACTION. USER SPECIFICALLY ACKNOWLEDGES THAT BTB IS NOT LIABLE FOR THE DEFAMATORY, OFFENSIVE, OR ILLEGAL CONDUCT OF OTHER THIRD PARTIES, MEMBERS, OR OTHER USERS OF THE FORUMS AND THAT THE RISK OF INJURY FROM THE FOREGOING RESTS ENTIRELY WITH EACH USER. D. IN NO EVENT WILL BTB OR ANY PERSON OR ENTITY INVOLVED IN CREATING, PRODUCING, OR DISTRIBUTING THIS WEB SITE BE LIABLE FOR ANY DIRECT, INDIRECT, INCIDENTAL, SPECIAL, OR CONSEQUENTIAL DAMAGES (INCLUDING BUT NOT LIMITED TO LOST PROFITS OR TRADING LOSSES) ARISING OUT OF THE USE OF OR INABILITY TO USE THIS WEB SITE OR OUT OF THE BREACH OF ANY WARRANTY. USER HEREBY ACKNOWLEDGES THAT THE PROVISIONS OF THIS SECTION SHALL APPLY TO ALL CONTENT ON THIS WEB SITE AND THE FORUMS. E. BTB NEITHER ENDORSES NOR IS RESPONSIBLE FOR THE ACCURACY OR RELIABILITY OF ANY OPINION, ADVICE, OR STATEMENT ON THIS WEB SITE AND FORUMS, NOR FOR ANY OFFENSIVE, DEFAMATORY, OR OBSCENE POSTING MADE ON THE FORUMS BY ANYONE OTHER THAN AUTHORIZED BTB EMPLOYEE SPOKESPERSONS WHILE ACTING IN THEIR OFFICIAL CAPACITIES. UNDER NO CIRCUMSTANCES WILL BTB BE LIABLE FOR ANY LOSS OR DAMAGE CAUSED BY A USER'S RELIANCE ON INFORMATION OBTAINED THROUGH THE CONTENT ON THIS WEB SITE AND/OR ANY POSTING ON THE FORUMS. IT IS THE RESPONSIBILITY OF EACH USER TO EVALUATE THE ACCURACY, COMPLETENESS, OR USEFULNESS OF ANY INFORMATION, OPINION, ADVICE, OR OTHER CONTENT AVAILABLE THROUGH THIS WEB SITE AND/OR THE FORUMS. PLEASE SEEK THE ADVICE OF PROFESSIONALS, AS APPROPRIATE, REGARDING THE EVALUATION OF ANY SPECIFIC INFORMATION, OPINION, ADVICE, OR OTHER CONTENT, INCLUDING BUT NOT LIMITED TO FINANCIAL, INFORMATION, OPINION, ADVICE, OR OTHER CONTENT. F. BTB DOES NOT ENDORSE, WARRANT, OR GUARANTEE ANY PRODUCT OR SERVICE OFFERED BY A THIRD PARTY THROUGH THIS WEB SITE AND WILL NOT BE A PARTY TO OR IN ANY WAY MONITOR ANY TRANSACTION BETWEEN USER AND THIRD-PARTY PROVIDERS OF PRODUCTS OR SERVICES. AS WITH THE PURCHASE OF A PRODUCT OR SERVICE THROUGH ANY MEDIUM OR IN ANY ENVIRONMENT, USER SHOULD USE HIS OR HER BEST JUDGMENT AND EXERCISE CAUTION WHERE APPROPRIATE. BTB HAS A NO REFUND POLICY IN EFFECT FOR ANY REASON. G. USER SPECIFICALLY ACKNOWLEDGES THAT IN NO EVENT WILL BTB, ITS AFFILIATES, OR ANY OF THEIR RESPECTIVE EMPLOYEES OR AGENTS BE LIABLE FOR ANY DIRECT, INDIRECT, INCIDENTAL, SPECIAL, OR CONSEQUENTIAL DAMAGES ARISING OUT OF (i) THE USE BY SUCH USER OF ANY BROWSERS OWNED OR OPERATED BY ANY PARTY AND/OR (ii) THE DOWNLOADING OF ANY SOFTWARE OWNED OR OPERATED BY ANY THIRD PARTY IN CONNECTION WITH THE SERVICE. H. USER AGREES THAT THE LIABILITY OF BTB, ITS AFFILIATES, AGENTS, AND LICENSORS, IF ANY, ARISING OUT OF ANY KIND OF LEGAL CLAIM (WHETHER IN CONTRACT, TORT, OR OTHERWISE) IN ANY WAY CONNECTED WITH THIS WEB SITE OR THE INFORMATION IN THIS WEB SITE SHALL NOT EXCEED THE AMOUNT USER PAID TO BTB FOR USE OF THIS WEB SITE. By using this Web site, user agrees to indemnify and hold BTB, its officers, owners, agents, and any employee harmless from any claim or demand made by any third party due to or arising out of the use of BTB services. BTB reserves the right, at our own expense, to assume the exclusive defense and control of any matter otherwise subject to indemnification by User. This indemnification and hold harmless obligation will survive use of this Web site. BTB releases may includes "forward-looking statements" within the meaning of Section 27A of the Securities Act of 1933, as amended, and Section 21E of the Securities Exchange Act of 1934. Certain statements set forth in this press release constitute "forward-looking statements." Forward-looking statements include, without limitation, any statement that may predict, forecast, indicate, or imply future results, performance or achievements, and may contain the words "estimate", "project", "intend", "forecast", "anticipate", "plan", "planning", "expect", "believe", "will likely", "should", "could", "would", "may" or words or expressions of similar meaning. Such statements are not guarantees of future performance and are subject to risks and uncertainties that could cause the company's actual results and financial position to differ materially from those included within the forward-looking statements. Forward-looking statements involve risks and uncertainties, including those relating to the Company's ability to grow its business. Actual results may differ materially from the results predicted and reported results should not be considered as an indication of future performance. The potential risks and uncertainties include, among others, the Company's limited operating history, the limited financial resources, and domestic or global economic conditions - activities of competitors and the presence of new or additional competition and conditions of equity markets. This Web site contains hyperlinks to other Web sites operated by parties other than BTB, and other resources and advertisers. Such hyperlinks are provided for user's reference only. BTB provides customized links to selected brokerage companies for user's convenience only. BTB is not a registered broker-dealer and does not endorse or recommend the services of any brokerage company. BTB is not responsible for the availability of these external sites nor is it responsible for any of the contents, advertising, products, or other materials on such external sites. BTB's inclusion of hyperlinks to such Web sites does not imply any endorsement of the material on such Web sites or any association with their operators. Under no circumstances shall BTB be held responsible or liable, directly or indirectly, for any loss or damage caused or alleged to have been caused in connection with the use of or reliance on any content, goods, or services available on such external site. Any concerns regarding any external link should be directed to its respective site administrator or webmaster. Copyright © 2003-Present. If you would like to reproduce and/or use part of or all of this text in a printed document for educational, non-profit purposes you are welcome to do so, all I ask is that credit be given to me on the same document this information is reproduced, and that none of this text be modified or altered (if you would like to add your own comments feel free to do so by including them in parenthesis and establishing that the comments are not my own.) I do not give permission for any contents herein to be reproduced in whole or in part on another web page or web site (whatever the nature or purpose) or to be reproduced in whole or in part in any publication or collection of widespread circulation, whether offline or online, for whatever purpose. If you would like to write your own "copyright disclaimer", "copyright page" or anything similar and you use this page as a source to obtain a major part of your information you must reference me as a source at the bottom of such disclaimer or page. Translations of this page into other languages are not authorized. If you find my information to be useful and/or educational and would like to lead others here, you are welcome to link to this page, but please do not place your link in such a manner as to mislead others to believe this page is a part of your web site, or as an "exit door" from your site without your visitors knowing where they are going (sometimes causes others to write to me thinking that I am you or the owner of your site).